We sometimes have adult cats or older kittens available for adoption. All adult cats available here are neutered, and sold for small prices covering mostly neutering. 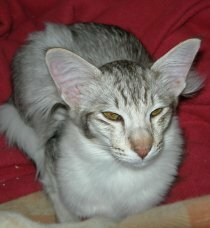 Our aim is first of all to find good families for our youngly retired breeding cats. Guylian, chocolate silver shaded OLH, neutered female, is looking for a nice retirement home. More information about Guylian, click here. We have kittens available. Click here.